Configuration of the Admin Panel in the Frontend for the user. # Note this is a frontend TypoScript template and not TSconfig! 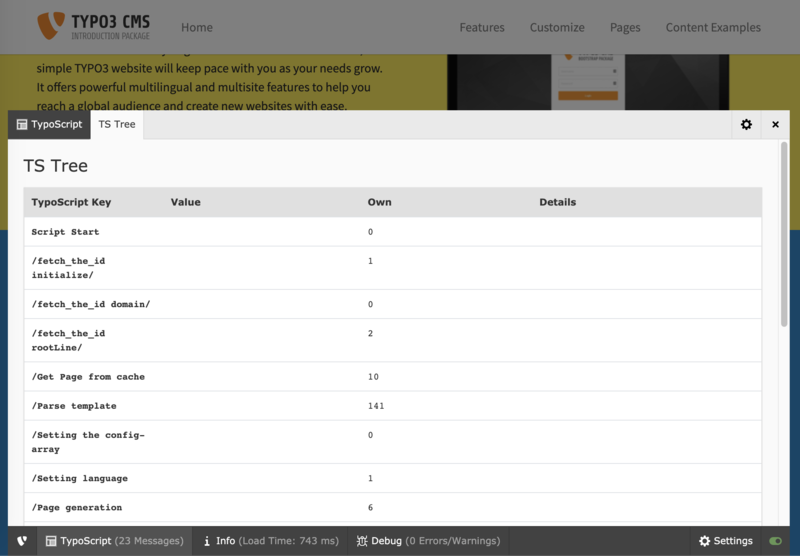 The admin panel code is being rewritten in TYPO3 v9, some of the options may be outdated, and most parts may eventually vanish altogether in the future. If you want to link to the login-screen of the backend, but wish that the user should return to the frontend for editing, you do that with this link, sending the "redirect_url" parameter to the login-screen. In that case the backend interface is not started. Used to enable the various parts of the panel for users. All values are 0/1 booleans. For admin users, admPanel.enable.all = 1 is default. The admin Panel is active for all admin users by default. If this does not fit the necessary setup, the different modules can be disabled. If set, the panel will not be displayed in the bottom of the page. This only has a visual effect.